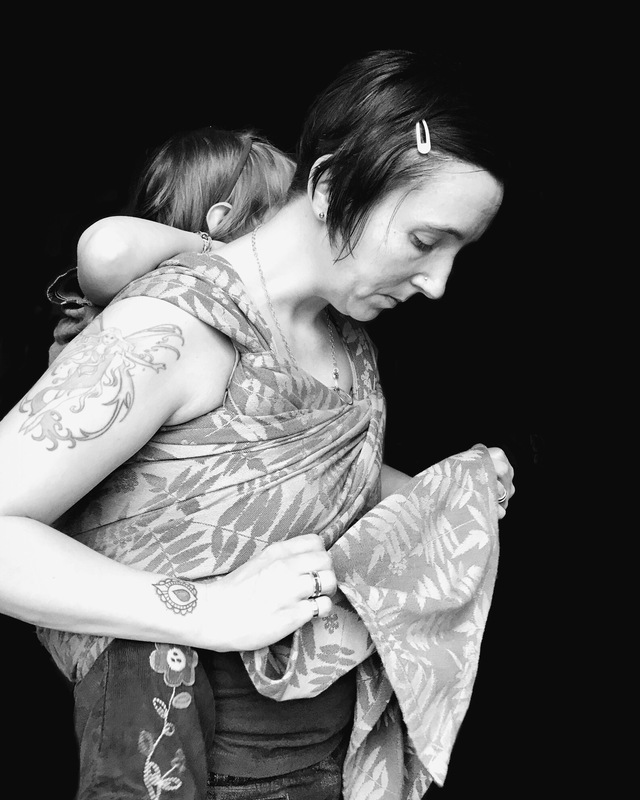 Sjala is Sweden’s only machine woven wrap maker and they’re mostly known for fantastic elastic merino wool wraps that can be worn much longer than normal jersey wraps. Their first woven wraps came out in spring 2016 and they now have three different designs. Rowan is the latest and the one I received has been travelling for a little while. 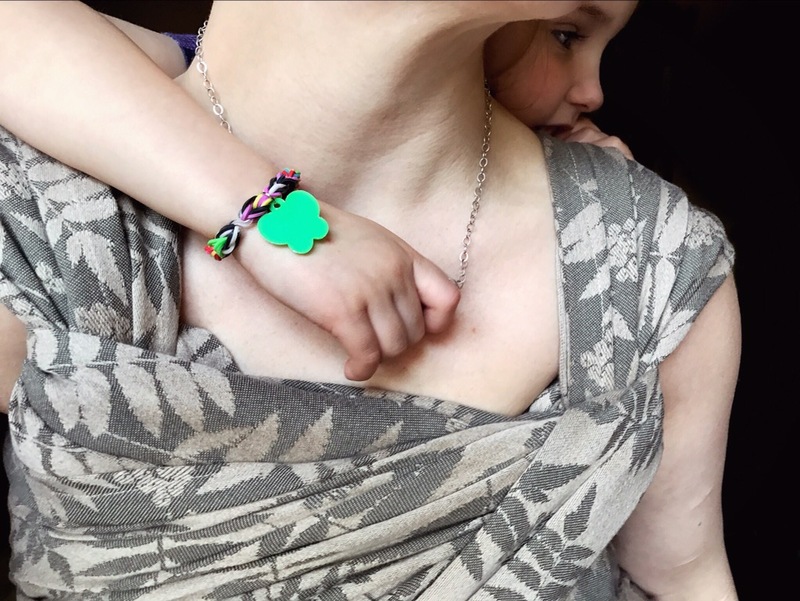 Rowan Viride is a neutral coloured wrap using two colours – a beige/gold and a mid tone sage green – that will suit most skin tones. Together these colours – which can be worn either way due to the flipped rails – give a gentle and chameleon like tone that blends well with whatever you’re wearing. The wrap design is a simple and well spaced repeat of rowan branches. 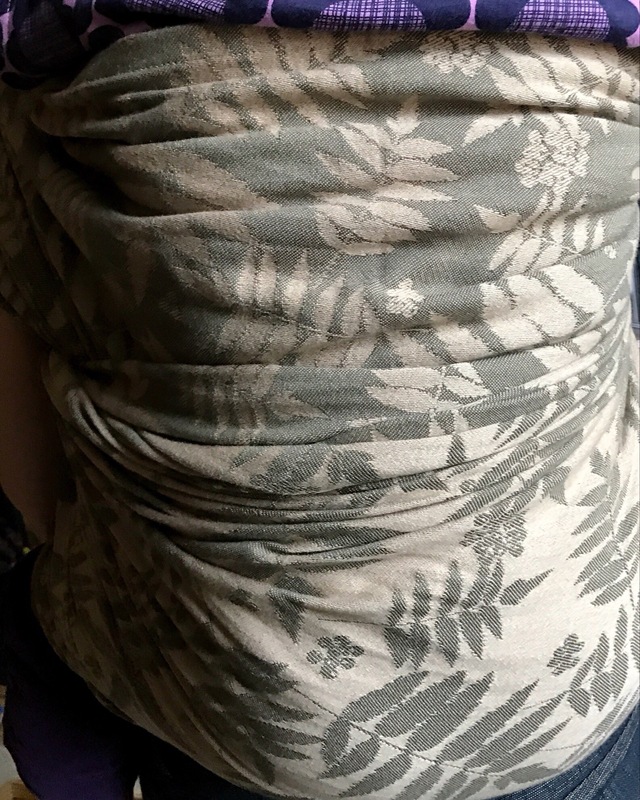 I like the fact that the repeat isn’t easy to see so that the foliage flows well across the wrap. 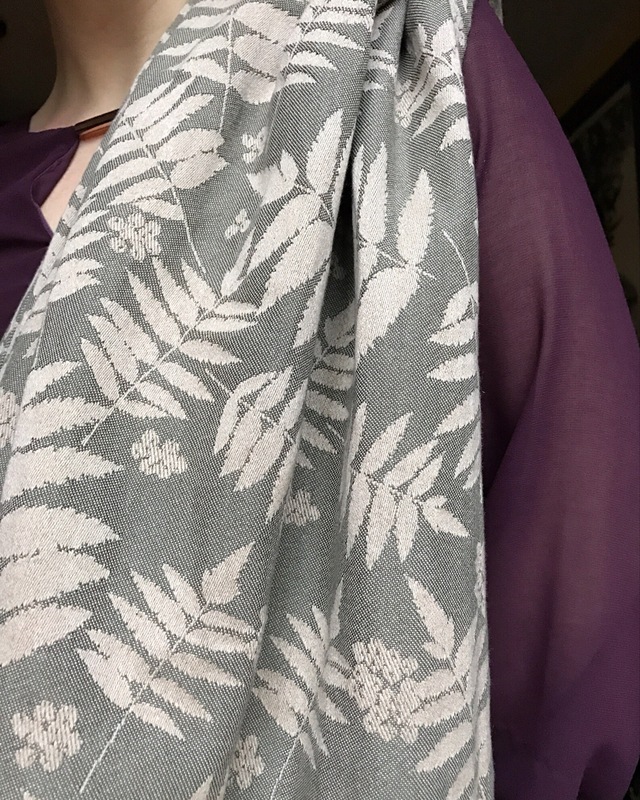 Flora designs are not unusual with wraps however Rowan is minimalist and feels fresh, modern. This wrap is 85% cotton and 15% cashmere and post wash I calculated a weight of approximately 310g m/sq. In hand it doesn’t feel as heavy, more medium weight with a good drape and density. Studying the pattern I am heartened that it would be tough to get too many pulls in the weave. It is also a fairly flat design so I was concerned this would be a little slippy to wear. In many ways this wrap reminds me of London Sling Company’s Voronoi Scandium which is the same blend, slightly higher density and similar flat feel. So if you know that wrap you might be able to imagine how this feels. I still regret selling that shorty as it was a fabulous ruck wrap. My reservations about the flat feel of the wrap were not realised when I worked with Viride. Obviously this wrap has been travelling and so it came to me well broken in with the cashmere nice and fluffed up. Having those little cashmere hooks all raised and wanting to find other bits of cashmere to cling to really assisted me. 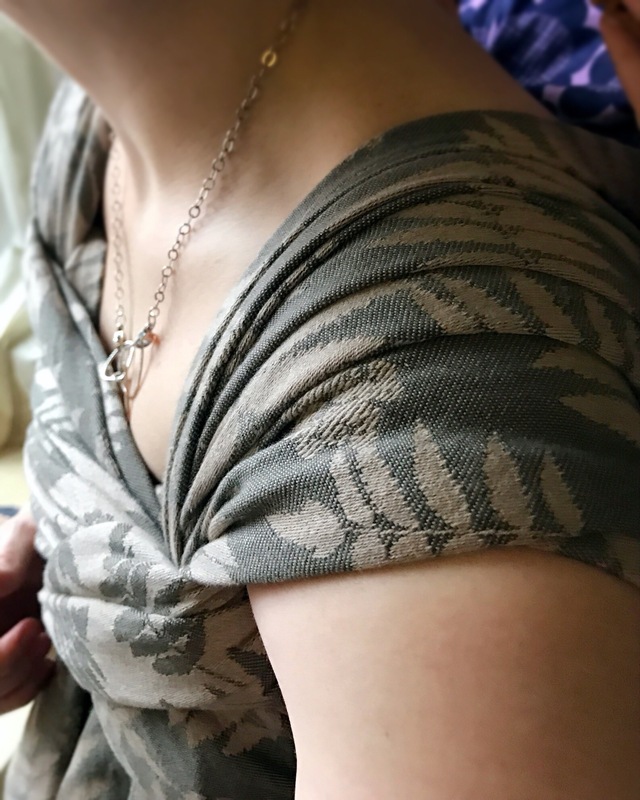 I also found that the blend had a good elasticity and though chest passes were not second-skin-like it was a wrap that tightened well and held. As a size 6, which is my base size, I mostly went for stock carries such as double hammock and it’s variations as well as some ruck variations. Therefore I was pleased that second passes, whilst not gliding into place, were not sweat inducing and I experienced no slip. My failed attempt at a sweetheart finish was entirely down to my slapdash wrapping skills rather than Viride. I must mention pleats. Yeah, they’re something that just randomly happen with me and never a feature I actively create when wrapping. So it’s a bit of luck that, when I peer at my shoulders, I discover pleasing pleats. I love pleats. I feel more confident that things are locked down and staying in place. So those pot luck, mythical pleats, well they happened every single time I wrapped with Viride. What can I say? It’s a wrap that wants to please with its very pretty pleats offered up without asking. Whether Viride was single or multiple layers I found there to be comfortable support and just enough cush for walks home with Smallest; those passes that held, well they stayed for the duration. Using Viride I experienced no sag or loosening of carries and knotless finishes stayed as I had wound them. Aside from this morning when Smallest was overtired I had no episodes of extreme planking that she is wont to do when she’s not up for a carry. 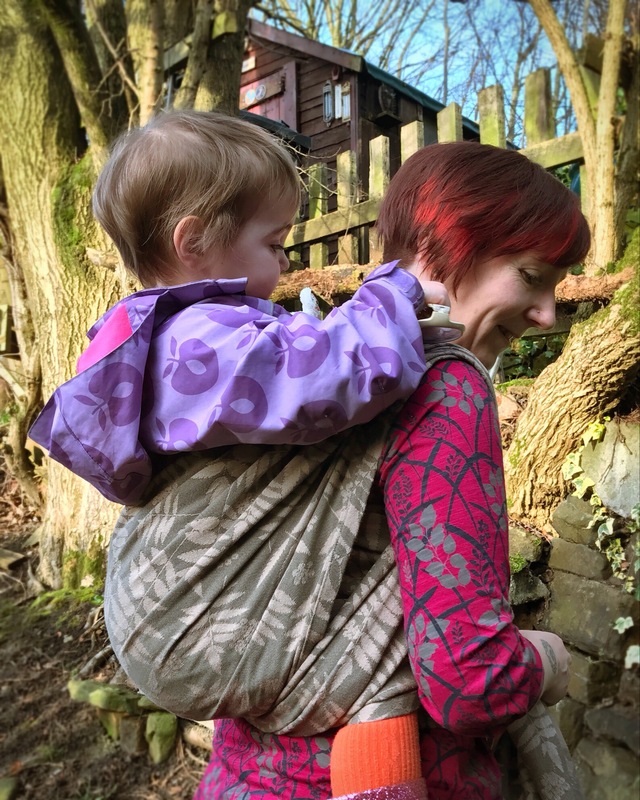 In fact she positively loved Viride, as a sure sign is her grasping for the wrap when I pop her in the buggy at handover time with my childminder. She did this and snuggled under Viride quite satisfied. A two year old is one thing but wrapping my nearly five year old is another. No wrap passes through my house without a good testing with my eldest. That happened today when Smallest was down for a nap. We both felt like watching My Neighbour Totoro so I loaded up the DVD and started to wrap her in a rear reinforced ruck with a bit of a vague knotless finish. She didn’t complain about pinched legs or uncomfortable areas, in fact she didn’t mention the wrap at all. 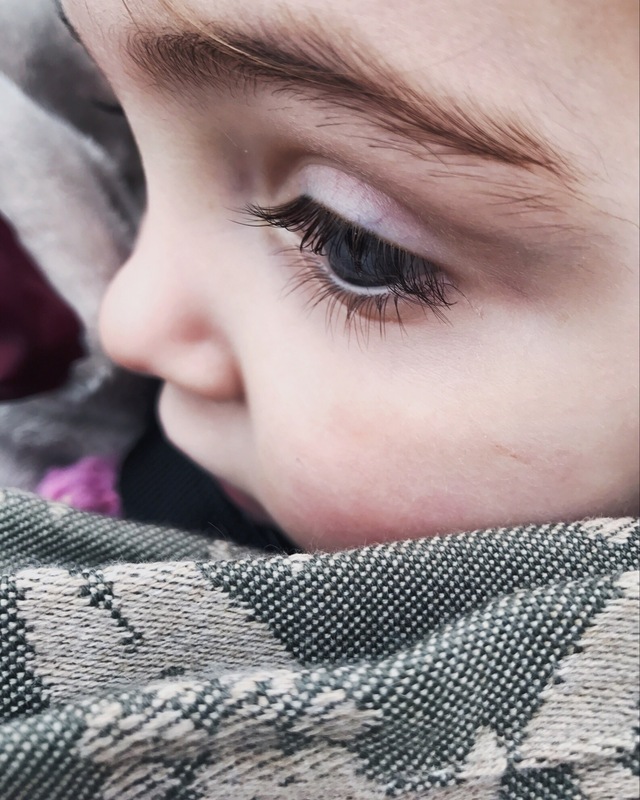 She was engrossed in Totoro with her arms slung loosely around me playing with my necklace. It was special and it felt sublime. We watched, swayed and I stood there for well over an hour which, for about 20KG of child and no motion to move her weight around, is quite a thing. Viride shone during that hour. I asked her if she was comfortable and she said “yes”; despite feeling her weight in my knees there were no angry red marks from pressure points on my skin. Viride is a very clever wrap. It doesn’t feel heavy in hand and it isn’t overwhelming to wrap with yet it has quite a bit of substance. The 15% cashmere lends it some softness and luxury without it feeling like a wrap you must treat with kid gloves. In fact I’d conclude this is your everyday workhorse that is a good all rounder from just out of squish age to as long as you can wrap. It is a wrap that suits both single and multiple layers and all experience levels. It’s due for release on 20/2/17 at 08:00 CET (09:00 GMT) via private message on the Sjala Facebook page. Sadly the seamstress was not as exacting as she should have been so all the wraps will be sold as seconds. Whilst seams are not as spot on as I experienced with All of These Lines Latte and the middle markers are slightly off I wouldn’t hesitate to recommend getting this wrap. It’s has been a thorough pleasure to host.